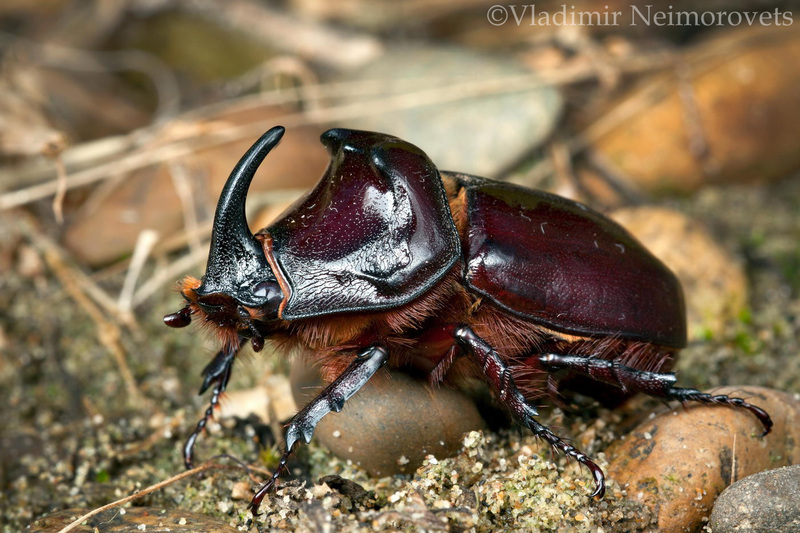 The european rhinoceros beetle Oryctes nasicornis (Linnaeus, 1758) belongs to the family of scarabs (Scarabaeidae). It is distributed throughout Europe (reaching the Leningrad region in the north), common in the Caucasus, and also found in the south of Western Siberia. The species prefers broad-leaved forests. Usually the beetles inhabit oak, willow and other species of trees. The development of larvae occurs in the roots and the bottom of the trunks of old dead trees, sometimes in fallen trunks and hollows. Oviposition occurs in the summer. The female digs into the rotten wood for this. Eggs can also be deposited in rotted manure or in heaps of shavings and sawdust. After the end of egg laying, the female dies. Eggs develop about a month. Hatching larvae feed on a substrate in which eggs were laid, and gradually reach huge sizes (up to 8 centimeters in length). The larva sheds three times and after the last molt it turns into a pupa in a special cradle, which it makes shortly before molting. Depending on climatic conditions and geographical latitude, the larva hibernates 3 or 4 times. Pupation occurs in April, but in the south of Europe even in March. The duration of the pupa phase is from 12 days to a month. Young beetles appear at the end of March and disappear in July. Rarely they can be found in August. They are active in the dark. During the day, beetles hide in shelters (under a layer of plant remains). The European rhinoceros beetle fly well, although it is not clear how it do it. In some sources it is reported that, from the point of view of the laws of physics, this species can’t fly at all. In experiments, labeled beetles were able to cross the English Channel! Surprisingly, the diet of an adult rhinoceros beetle has not been studied. Some researchers argue that adult beetles do not eat at all. The structure of the mouthparts of this species speaks in favor of this statement. And if the beetles eat, so only soft or liquid food (for example, the juice of trees, which flows from damages of trunks or branches). 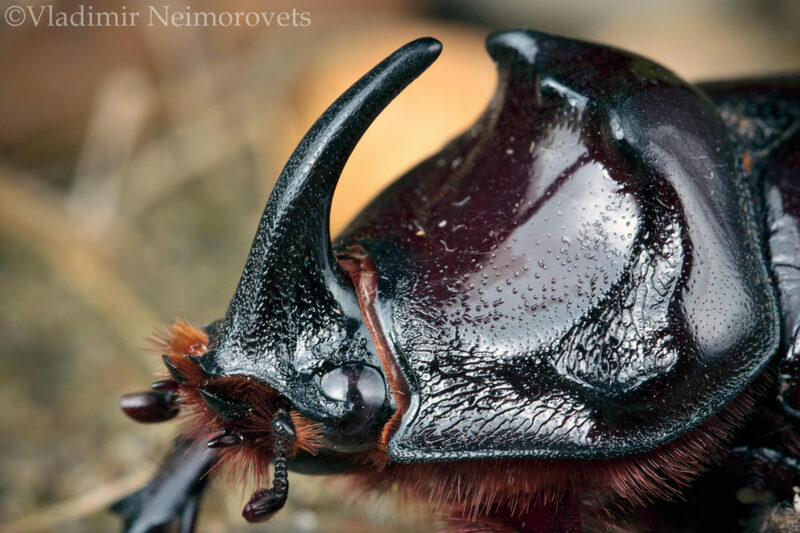 The European rhinoceros beetle has many enemies. There are gamas mites (Mesostigmata order) in large numbers on these beetles. The larvae of the mammoth wasp (Megascolia maculata) parasitize on the larvae of rhinoceros beetle. Birds, raccoons and other animals willingly eat the beetles and its larvae on occasion.